Create your own supervisor tips newsletter, or use ours, or someone's to build relationships with supervisors so they will naturally refer more often. 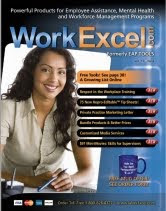 You'll get more more EAP referrals, more at-risk employees, and you will see more alcoholic workers. Make it short. Make it sweet. Make it easy to read and relevant to supervisory issues, especially relationships, conflict, leadership, morale, productivity, team building, attitude issues, communication, and improving employee engagement. Send it monthly for maximum top-of-mind-awareness, not because I think you should, but because that is what is needed. Every marketer will tell you this--frequency is king, not quantity. 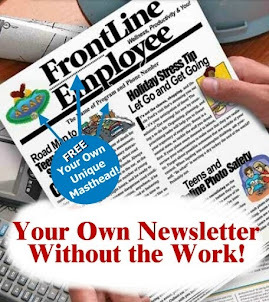 A two page newsletter sent monthly is 50% more content per year than a four-page sent quarterly. And a 2-pager is more likely to be completely read. This is how you boost your EAP utilization. You also deepen your integration within the organization. Supervisors "sit" on troubled employees and often do not refer them until a crisis hits. It takes some nudging to get them to loosen their grip. This requires them trusting you, and then thinking of you first when a incident (or crisis) occurs. So also regularly educate supervisors about the EAP, how to refer to it, all the nuances associated with communicating effectively with you, how to avoid armchair diagnosis, how to follow up, how to help the EAP maintain and nurture the perception and reality of confidentiality, and remember to put yourself out there as a consultant regarding documentation, coaching, referral to the EAP, motivating of employees, engagement, conflict resolution, morale improvement, and making performance improvement plans more effective. You will grow your influence. 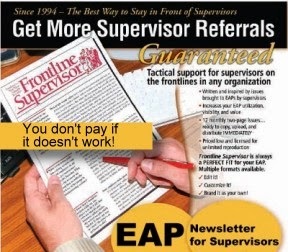 Here is a sample supervisor newsletter and information.